"Good is just bad that hasn't been caught yet." Description: Mae walks the border between dark and light with a confidence twice as big as she is. Small, wiry, quick as a whip and strong as one too (or so she boasts), she's not a presence easily missed unless she wants to be. 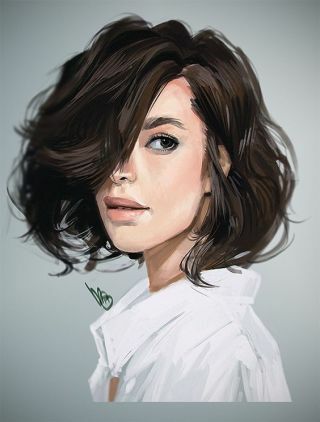 Her thick dark hair has been cut short and falls in unruly waves to jaw-length, framing a sharp face composed of features just a little too large for their canvas. Big brown eyes with thick lashes are a pretty feature but her nose is too hawkish; her mouth too wide; her chin is a dimpled and jutting angle that precedes her everywhere. She has the pale skin of a person born to shadows but it's strewn with freckles that from a distance are too easily mistaken for flecks of dirt. At a glance, she's too easily branded as being Boroughs spawned and it doesn't appear to bother her a bit. Personality: Devil-may-care Mae doesn't so much defy rules as exist in a world of her own devising where rules don't apply. She's always been clever enough, loud enough, charming enough, or fast enough to skirt repercussions in an environment where harsh penalties apply to those who cross the wrong person's path or turn down the wrong alley at the worst possible moment. Some say it's luck, Mae claims skill, but all admit she's just a -little- cocky. Background: Even for a Culler it can be catch as catch can in the Lower Boroughs, especially if a person is born the seventh of eight children. Her Mam wasn't much interested in being a mam by the time her last few pups were spawned; the rearing of the little ones was often left to their elders, who were even less fit to serve as surrogate parents. Not a fan of being cuffed upside the head and ordered to stay put, keep her mouth shut, do what she's told, Mae quickly learned to skirt the authority of her older siblings. Her small size and agility developed into an early reputation as an escape artist and it became a common refrain around their shack that, "Mae's on t' roofs again!" From her earliest years, she was no more respectful of other people's property than she was of familial attempts at laying down the law, such as it was among the gutter clans. For all the heart attacks she provoked among her relatives for her high-climbing ways, her youthful escapades often ended with a carrier pigeon in the cook pot or an extra blanket plucked from a drying line to lay over their beds, so complaints were half-hearted at best. If the clan needed a thing and Mae could find the thing, take the thing, and carry home the thing, then clearly the thing ought to have been theirs in the first place and its original owner should have kept a closer eye on it. Wrath was kept to a minimum due to the process sometimes happening in reverse, with gifts laid on the steps of those who'd suffered her light-fingered ways previously. It helped too she never took anything -dire-, and diligently avoided the notice of the official authorities and their harsh law-blessed hands. It was a Boroughs matter, and she knew the lines that shouldn't be crossed against her own because they were bred in the bone, channeled in her blood. Childish recklessness of Mae's sort is often turned to harder crimes as the years wind on but there her luck held true as well. Instead of being swept into the greater organizations whose deeds stepped well over the line into darkly illegal, she detoured into reputable work as a messenger, running scraps of paper for pennies to begin. Eventually, her reputation for reliability (and ultraquick service!) saw her client base expanding until finally, her name came to the notice of the Black Rose Mummers. The numbers of messages flying to and from their theatre is prodigious, the correspondence between the actors and their fans a close rival for the missives arranging and organizing new performances. A trial period became regular employment and since then, Mae's not wanted for much else in the world. Gibson - Bless 'im for that head full o' sunlight. Ferrando - Rooted as a mountain but with a better punch. Cybele - What would you do if you woke up one day and the sun wasn't shining? If the sky wasn't blue? If the trees weren't green? Luca - Can you teach her how to do nothing? Please? Calandra - Pipes like polished tin, that one. Ravna - A rum cove with the gods' own luck. Acacia - Ever fall in love with a hero, then peel back the mask and find out they're just human? And love them all the more for it? Fortunato - Through frustration, art. Torian - Old Uncle Torian, who ain't really neither. Mayir - Sorta like me but with more "rrr"
Aureth - One of the best choices I ever made all on my lonesome. Magpie - So, in conclusion, birds are not terribly complex creatures. If you ever find one making noise, stop and look around. You are likely in their territory, or have become their territory. Laric Mae Culler has the distinct honor of being perhaps the only individual, in a thousand years, to have ever signed an official Inquisition document with a heart. It says something admirable about her character.